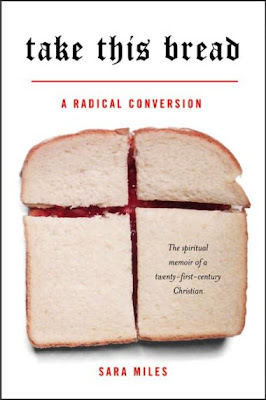 If not wholly unique, this simply and clearly communicates what the book is about - a woman's conversion to Christianity and her founding a food bank. The designer is Lynn Buckley. Agree fully on the goth metal type selection. Sorta strange, right? An unusual paring with what appears (at that small size) to be Mrs. Eaves italic. Not exactly cut from the same pedigre. Love the cross-cut sandwich. But for me, a major weakness here is the treatment of the secondary subhed ("The spirtual memoir of..."). In that negligible italic, it looks more like a photo caption. And, beyond the design flaws, the language itself is not compelling: "A Twenty-First Century Christian"? Nothing persuasively "radical" there. Wasted words, wimpy design.